MT. 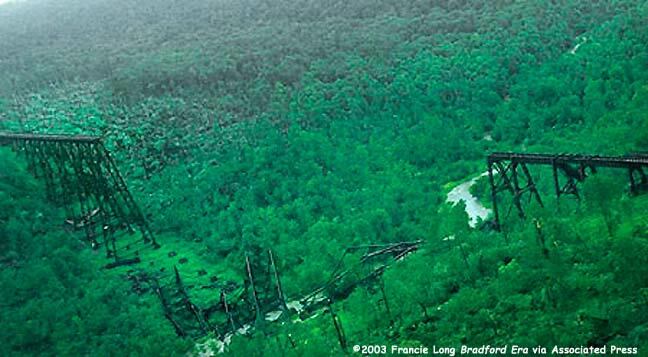 JEWETT, Pa. — The mood was somber Tuesday when area officials and members of the press toured what was left of the Kinzua Bridge. The center of the historic 103-year-old structure was destroyed by a tornado Monday. Confirmation that a F-1 tornado did strike the bridge was made by an official with the National Weather Service who toured and assessed the area Tuesday. Meteorologists in State College said the tornado that struck the bridge area hit between 3:15 and 3:30 p.m., had wind speeds up to 100 mph and was 3 1/2 miles long a third of a mile wide. Other news on Tuesday included a declaration by the state naming McKean County as a disaster area. An official stated that neighboring Potter County, which experienced a F-3 tornado near Coudersport, is also in a state of emergency. During a tour of the bridge, state Rep. Martin Causer said he would make every effort to push for the rebuilding of the bridge. “It’s crucial to the area. It’s the biggest tourist attraction in the whole region,” Mr. Causer said after walking back from the bridge. Barrett Clark, Kinzua Bridge park manager for the Pennsylvania Department of Conservation and Natural Resources, said the park is not allowing visitors into the area because of the numerous fallen trees and debris. There are also no restrooms, water or electricity for public use. Walking to the bridge now requires officials to walk around toppled trees and down steep grades to reach the train tracks. Railroad cars that housed the concession area at the park are now covered with large branches and treetops. Train tracks that once covered a distance of 2,053 feet along the top of the bridge can be seen bulging up at the end of the truncated bridge before dropping over the edge and dangling down a couple of hundred feet. Looking down, visitors could see a 1,200 foot expansion of the bridge laying at the bottom of the gorge, as though a giant hand had pushed it over on its side. One construction worker at the site Monday told others he heard several loud booming sounds when the tornado hit. “This is all that is left,” Mr. Clark said in a quiet tone as he looked in the direction of the bridge. While officials looked around on top of the bridge, the buzzing of chainsaws could be heard in the gorge hundreds of feet below. Mr. Clark said workmen were cutting out trees along an road beneath the bridge to allow crews to come in and assess the damage from the ground. He said a regional swing crew from the DCNR will arrive at the area Wednesday to assist with the ground cleanup. He said area residents have been hiking into the gorge to see the damage and could be putting themselves at risk. “A lot of that metal will shift with the temperatures and it’s extremely unstable,” Mr. Clark said. “We know people want to come out and see it and we’re working at trying to get things stable” so the public can come out. He said the bridge will likely become something of a new tourist attraction and the park will publicize news releases when it is safe to visit. “I understand the public’s desire to see this, because it is national, but they’re going to have to understand things do take time,” he said. Steve Brode of W.M. Brode Construction Co. said he and his family’s company are uncertain what the future holds for their work at the bridge. The company had been working for the past several months on a $10.8 million restoration project of the bridge which included replacing and repairing rusted sections of the structure. Most of the men were not at the site during the day of the tornado because of bad weather. No one was injured except a park employee who was trapped in a maintenance building when trees fell on the building. Mr. Brode said the situation is hard for the company because it had employed approximately 30 men for the restoration project. He said only about half of the crew have been called in to work since the tornado. “This is going to affect everything ... the hotels we’re staying at ... my guys eat every night, drink beer every night, all that stuff adds up,” Mr. Brode said.